Where did Lucky Devil come from? It’s really become a love it or hate it thing for people. I do have a pretty deep spiritual belief system that subscribes to a higher power, deeper meaning, “the force”. Whatever you want to call it. I don’t really buy into the notion of a physical guy called God and a physical guy called Satan though. So when I use a devil in my guitar logo or artwork it’s got zero to do with the actual Satan. 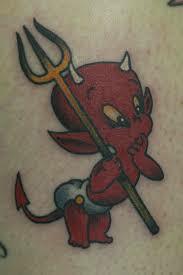 I’m old enough to remember back in the day a lot of guys would get these little baby devil tattoos for whatever reason. They were these little red guys with wings and a pitchfork and usually wearing a diaper of some sort. Sometimes the tat would have a tagline. Something intelectual like “I was born to be bad!” or “Bad to the Bone!” or “The Devil made me do It!”. I’m pretty sure they were meant to let girls know that “I’m really not a bad guy if I have have a baby of some sort on my arm but I am bad enough to have a tattoo and drive your Mom crazy!” sort of logic to them. The truth is, as an adolescent kid growing up in the 70’s and 80’s, I liked the tattoos. Sidebar, my parents divorced when I was 9 and I have 2 younger brothers so my now single mother never stood a chance once we were teenagers. We ran as hard and wild as we pleased. Ended up in a lot of harmless trouble. Like a lot of kids from less than great backgrounds we were a handful but not actually a threat of any sort. I never ended up with a criminal record. Eventually went on to get a formal education. Got married, had 2 kids, some dogs. You know, the usual American Dream we’re all taught to adhere to. I just look back at how things started out for me and how they ended up and I just know how lucky I am to be where I am. Lucky to have the creativity and talent to do what I want to do with my life. Lucky to have a wife who lets me be me. Lucky I have children who love me and don’t complain that I could never take them to Disneyland. 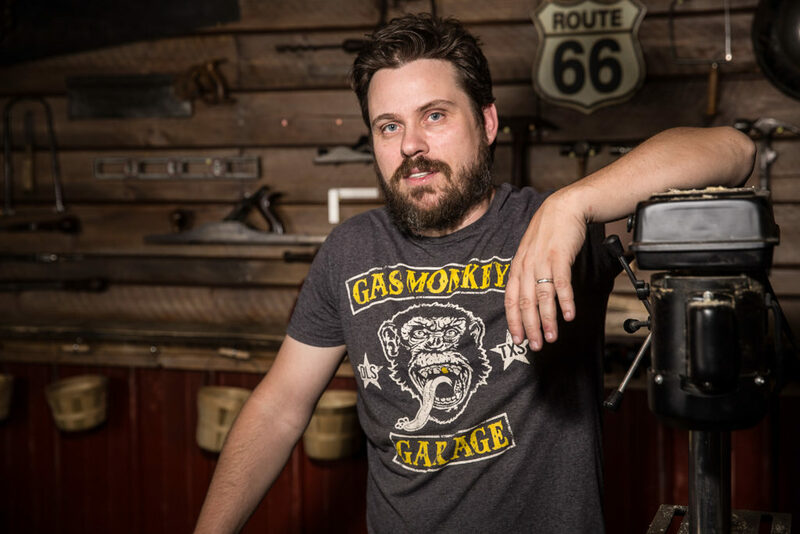 Being a self employed artist isn’t just hard on the artist, it’s hard on everyone around them. It takes a lot of sacrifice and commitment on everyone’s part. That’s why most dreamers and artists become teachers and accountants or weekend hobbyists. I’m a very lucky guy born with a stubborn streak. I just sort of identified with those little devil tattoos because of that I guess. 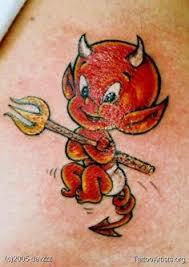 So the Lucky Devil name and the logo aren’t born out of some weird, angry, or satanic belief system. It’s just me. I’m the Lucky Devil. Enough said.